I have no idea why I knit the things I do. Really, sometimes knitting is just a compulsive behavior, that I seem to have no control over. Sure I knit hats for friends, and socks for my S-I-L, and I give away shawls, and scarfs as gifts. But, I still knit more—and more, and more and more. I have hardly bought any yarn in the past few years--(there is one up side to not having a car)--thought I still have been gifted yarns, lovely yarns. Shopping bags full of yarn. Even with out buying yarns, I still end with more yarn no matter how fast I knit. And here I am, making a Pi Bi shawl. It is EZ classic pattern, every time the number of rounds doubles, so do the number of stitches, (a binary sequence! ( and in a few more rows (well technically rounds—but I am working each segment in a lace pattern measured in row!) I will be ready to double the 256 stitches into 512—and start a new pattern. 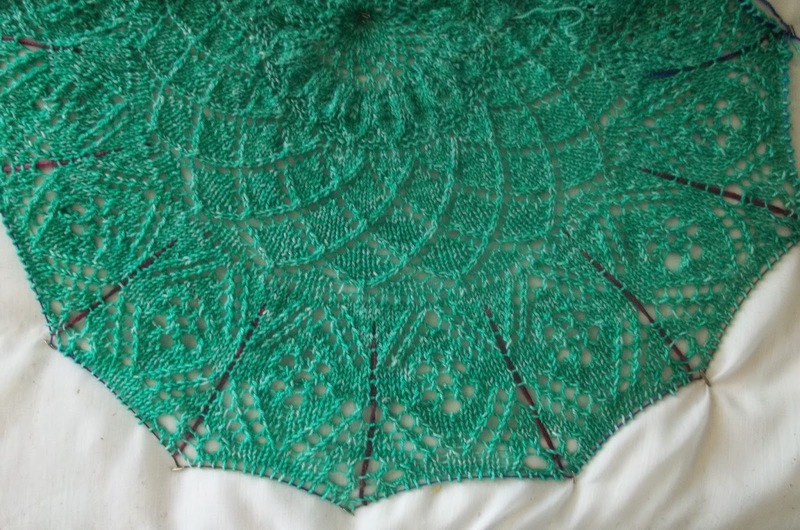 Here is how it looks now—its about 24 inches across, but it could be blocker larger (if it was wet) and I still have a lot of green yarn left. I might pause then, Just as I paused after 128 stitches. 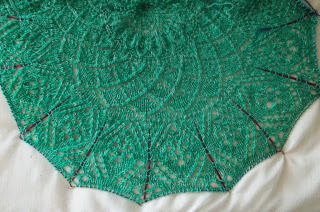 But this shawl was started this year, and will be finished this year—though it is likely I will run out of the mint green yarn—but I have some creamy white –which could become any color, but won't—it will just be a creamy white frosted ring to finish the shawl. Then there is the collection of cottons (and some linen, too) I could do nothing but knit cottons --potholders, wash cloths, bathmats, and place matts for a solid year—and still, I think, not exhaust my supple. My friends all have an ample supple of hand knit potholders, too. There is only so much I can foist off on them. And once again I ask myself: Why?